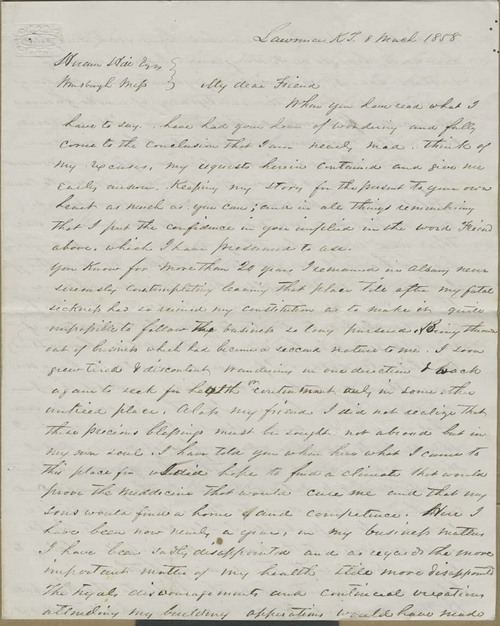 Nathan Starks wrote from Lawrence, Kansas Territory, to Hiram Hill in Williamsburgh, Massachusetts, asking for Hill's assistance in securing his old homestead in Massachusetts. Starks described his situation: he had moved to Kansas Territory seeking better health and business, but had been disappointed in both of those, the social scene, and the lawlessness of the land. He hoped to return to his old homestead in Massachusetts after a year of life in Kansas Territory, provided that it had not been sold.